Look for a set of small (8×5 inches) set of red booklets. Grab one – this will have the English translation for the Latin to help you learn what is happening when. If there is a single sheet of white paper grab that too – it will have the main reading and the Gospel for the day’s Mass written on it. Prior to the Mass you can seek out someone who is familiar with the Mass to sit with. Tell someone you are new and are looking for someone to help you through the Mass. In particular anyone who has a small leather booklet with gold-bound pages or is in a cassock should be a good source to ask for help. 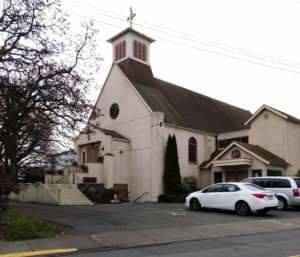 After Mass (on Sundays), there tends to be a get together in the Parish hall (if applicable). You are welcome to track down the Priest and ask him any questions if you feel comfortable. Read some of the differences you will notice at the Mass below. While the priest prays most of the Mass in Latin, the official language of the Roman Catholic Church, he preaches his sermon in English. A red booklet missal (Latin-English) is provided that contains the prayers of the Mass in both Latin (on the left page) and English (on the right page) to assist you as you pray the Mass. We also have booklets in Latin-Chinese, Latin-Spanish, and Latin-German. The red booklet will be sufficient for you for the time being, as your “training manual.” Most people eventually purchase a Daily Missal, which contains all the readings and prayers of the year in one book. The parish office can provide more information on how to get a full Daily Missal. Stick with the red booklet for the time being. People are very quiet as they come into the church before Mass, to show reverence for the Blessed Sacrament in the tabernacle and to prepare themselves for the Mass. There are also periods of silence during the Canon of the Mass (the Eucharistic Prayer) while the priest is praying very quietly at the altar. When entering the church, bless yourself with the holy water, go up to your pew, then genuflect in the aisle on your right knee, towards the main altar, where the Blessed Sacrament is reserved in the tabernacle. If there is Exposition (the Blessed Sacrament is exposed for adoration in a monstrance above the tabernacle), kneel on both knees in the aisle and bow your head before entering the pew. When leaving your pew, genuflect towards the altar (or kneel again on both knees if the Blessed Sacrament is exposed). Please do not genuflect again as you exit the doors; you have already done so as you left your pew. The priest faces the tabernacle and the altar as he offers the Holy Sacrifice of the Mass. Some may mistakenly think that the priest is turning his back on the people. Quite the contrary: the priest and congregation are deliberately facing the altar together, uniting their prayers during Mass. The priest faces the same direction as the people as he shepherds and leads them on their pilgrim journey to God. This unity in posture is traditional to the Roman Rite and is rooted in the practice of the Jewish synagogue. This posture is also traditional to the Eastern Rite Catholics, such as the Ukrainian Catholics. The crucifix in the sanctuary and on the altar remind us that the sacrifice of the Cross and the Holy Sacrifice of the Mass are one and the same sacrifice. As mentioned above, there are red booklet missals for those who wish to follow along with the text of most of the Mass. The changeable parts of the Mass, including the Scripture readings (Epistle and Gospel) of the day as well as the Proper prayers of the Mass, are available in the Daily Missal, which is available for purchase through the parish office. If you are unsure when to stand, sit, or kneel, follow the instructions in the missalette. Follow the instructions for the High Mass when the Mass is chanted (sung) at 10:30 a.m. on Sundays and at 7:30 p.m. on special feast days. Follow the instructions for Low Mass when the Mass is spoken (recited) at 8:00 a.m. on Sundays and at other times during the week. If you wish, simply follow those around you! 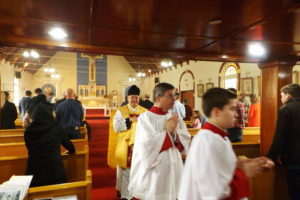 At the Traditional Latin Mass, you receive Holy Communion while kneeling (if you are able to do so) at an altar rail, placing your hands under the white communion cloth. You receive the host on the tongue, not in the hands. In addition, you do not respond “Amen” to the priest; the act of kneeling is in itself a kind of “Amen.” The Roman Catholic Church permits baptized Catholics who are in a state of grace (that is, those who have confessed all mortal sins to a priest) to receive Communion. Fasting before receiving Communion is an act of penance and causes us to hunger for the Lord. The 1983 Code of Canon Law calls for a Eucharistic fast of at least one hour. The longer devotional fast of three hours is optional, at the discretion of each individual, but it is not strictly required by the Church’s current disciplinary law. We ask everyone – men and women – to please dress modestly for Mass, because: – We are in the presence of the Blessed Sacrament. – Our attire should not be distracting to those around us. Traditionally, ladies often wear a head covering, or mantilla, during Mass. Doing so is a sign of humility and purity before God and is encouraged.